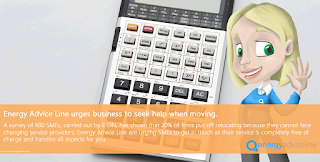 The poll of 600 small businesses by Big Six energy supplier E.ON found that more than a fifth of firms have put off moving because they could not face dealing with transferring service providers, including energy companies. Overall, SMEs delay moving premises because it is the most stressful task they undertake after hiring new staff. Even handling finances, covering staff absences and dealing with customer complaints are less onerous, according to the survey. The poll also revealed that moving premises costs the average SME an estimated £40,000 over five years, accounting for around 2.5% of their annual turnover, and included the actual amount spent on moving and upgrading new premises as well as the losses caused by disruption to business. “We understand that arranging essential services like gas and electricity in new premises can be very stressful, but putting off relocating just to avoid this has the potential to impede a firm’s future growth,” Mr Morgan said. “Arranging energy supplies at a new property can be complicated, but not if you take control: you can choose to do it the easy way or the hard way. “The hard way is to move but park the question of energy in the too-hard basket, which is not a good idea. This puts business owners at the mercy of rogue energy brokers who prey on firms that have just moved into new premises by cold calling and using high-pressure techniques to sell deals that are not competitive. “Doing nothing also increases the chances of a firm paying significantly more than they need to by automatically moving onto the expensive standard tariff supplying the premises when they move in.